During the Late Jurassic, sea level appears to have risen steadily, as evidenced by the continued recession of the continental margin. On the platform, however, carbonate deposition kept pace with and finally superseded the flooding, reestablishing very shallow depositional conditions over the southern part of the Middle East (Murris, 1980). 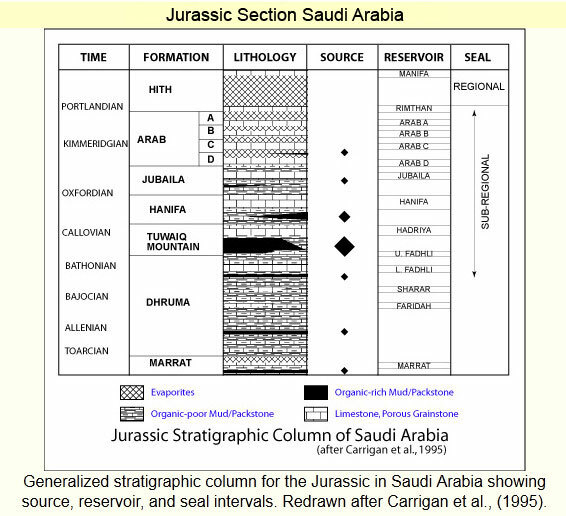 This section presents an overview of the petroleum system for the Arabian basin including the current state of petroleum production and reserves of Saudi Arabia, and an over view of the Arabian basin Late Jurassic geology is presented in term of its source-reservoir-seal triplet. The Saudi Arabian government signed the first concession on May 29, 1933 which gave Standard Oil of California (Socal) exclusive rights to prospect for and produce oil in the eastern regions of Saudi Arabia (Nawwab et al., 1980). This agreement was to run for a period of sixty-six years. Exploration and drilling commence shortly after; and on April 30, 1935 California Arabian Standard Oil Company (Casoc, a new subsidiary of Socal) began drilling the first oil well (Dammam Well No. 1), which was a disappointment since very little oil actually was found at a shallow depth. On December 1936, drilling on Dammam Well No. 7 started and on March 3, 1938 oil began to flow at a rate of 1,585 barrels per day from the Arab Formation of the Upper Jurassic. By March 22, the oil was flowing at a rate of 3,810 barrels per day. The Dammam Well No. 7 marks the turning point and the beginning of the oil era in Saudi Arabia. The Dammam Well No. 7 produced for over 50 years (Nawwab et al., 1980). More major discoveries were made in the subsequent years including the Abqaiq Abu Hadriya fields in 1940, Qatif field in 1945, Ain Dar field in 1948 and others. On January 31, 1944, Casoc changed its name to the Arabian American Oil Company (Aramco) and by 1947 this consisted of The Texas Company (Texaco), Standard Oil of New Jersey (Exxon) and Standard Oil of New York, Socony Vacuum (Mobil). A subsequent change in oil policy led the Saudi government to acquire a 25% share of ARAMCO in 1973, and it increased its share to 60% in the following year; in 1980, the Saudi Arabian government took 100% control of the company backdating this to 1976 and retaining ARAMCO as the operator (Alsharhan and Nairn, 1997). In 1950, Average crude production was running at about 500,000 barrels per day (MMBD) and doubled by 1958, then doubled again in 1956, and in 1970 it reached 4 million MMBD; by 1974 is stabilized at 8 million barrels per day (Nawwab et al., 1980). The current daily production now stands now at 9.2 MMBD (EIA, 2002). Since 1990, Saudi Aramco has replaced its cumulative oil production and added new reserves and has increased its gas reserves by 20.7 TCF; 9.7 TCF are non-associated (Alsharhan and Nairn, 1997). Saudi Arabia is believed to have some 259 billion barrels of proven oil reserves (with 5 billion barrels of proven reserves in the Saudi-Kuwaiti "Neutral Zone") accounting for more than one-fourth of the world total and up to 1 trillion barrels of ultimately recoverable oil. Saudi Arabia is the world's leading oil producer and exporter. During early 2001, Saudi Arabia produced around 9.2 MMBD of oil (including half of the Saudi-Kuwaiti Neutral Zone's 600,000 bbl/d), compared to production capacity of around 10.5 MMBD (EIA, 2002). 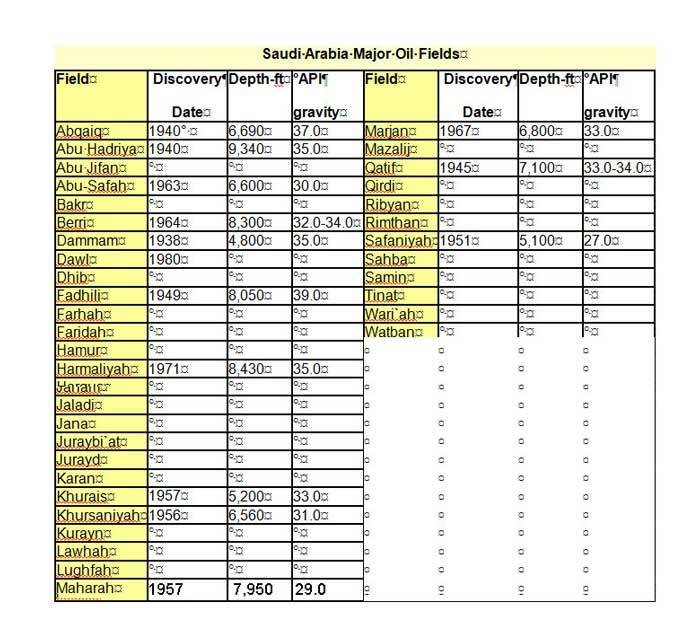 Saudi Arabia has about 77 oil and gas fields (over 1,500 wells, see table to the left) of which eight fields contain half of its oil reserves. These fields include the super giant Ghawar (the world's largest onshore oil field, with estimated remaining reserves of 70 billion barrels) and the Safaniya (the world's largest offshore oilfield, with estimated reserves of 19 billion barrels). Ghawar's primary producing structures are, from north to south: Ain Dar, Shedgum, Uthmaniyah, Farzan, Ghawar, Al Udayliyah, Hawiyah, and Haradh . The Ghawar filed accounts for about half of Saudi Arabia's total oil production capacity. The range of crude Saudi Arabia produces ranges from heavy to super light (API 27 o -50 o) (table 6.1). Of Saudi Arabia's total oil production capacity, about 65%-70% is considered light gravity, with the rest either medium or heavy. The lightest grades generally are produced onshore, while the medium and heavy grades come mainly from offshore. The Ghawar field is the main producer of 34o API Arabian Light crude, while Abqaiq produces 37o API Arab Extra Light crude. Since 1994, the Hawtah Trend of Central Saudi Arabia, which includes the Hawtah field and smaller satellites (Nuayyim, Hazmiyah) south of Riyadh, has been producing around 200,000 bbl/d of 45o-50o API, 0.06% sulphur, Arab Super Light. Offshore production includes Arab Medium crude from the Zuluf (over 500,000 bbl/d capacity) and Marjan (270,000 bbl/d capacity) fields and Arab Heavy crude from the Safaniya field (EIA, 2002). Saudi Arabia's proven gas reserves are estimated at 204.5 trillion cubic feet (Tcf), ranking fourth in the world (after Russia, Iran, and Qatar). Around 65% of Saudi Arabia's currently proven gas reserves consist of associated gas, mainly from the onshore Ghawar field and the offshore Safaniya and Zuluf fields. The Ghawar oil field alone accounts for one-third of the country's total gas reserves. Most of Saudi Arabia's non-associated gas reserves (Mazalij, Al-Manjoura, Shaden, Niban, Tinat, Al-Waar, etc.) are located in the deep Khuff reservoir, which underlies the Ghawar oil field (EIA, 2002). During 2000, Saudi Arabia exported 1.57 MMBD of oil to the United States (17% of U.S. crude oil imports) ranking second (after Canada, and just ahead of Venezuela) as a source of total (crude plus refined products) U.S. oil imports, and first for crude only (ahead of Canada and Mexico) (EIA, 2002). This section provides a brief overview of the source-reservoir-seal triplet of the late Middle to the Upper Jurassic of the Arabian Basin. Hanifa sequence stratigraphy section provided more detail of the sequence stratigraphic analysis of the Hanifa Formation source and reservoir. Please refer to for formation nomenclature and lithology. The Tuwaiq Mountain Formation and Hanifa Formation of the Jurassic Callovian-Oxfordian are believed to be the primary source for the overlying prolific hydrocarbons accumulations of the Upper Jurassic Arab Formations. The Tuwaiq Mountain source rock is dominant in the southwest while the Hanifa source rocks are present in the northwestern region of the Arabian Basin. Carrigan et al. (1995) also determined that the oils in the Arab and Hanifa reservoirs have similar bulk compositional, isotopic, chromatographic, and biomarker signatures and matched the overall Hanifa and Tuwaiq Mountain source rock extract characteristics. The primary facies of these rocks are thinly (0.5-3 mm thin) laminated lime-mudstone with total organic contents (TOC) averaging between 3-5%(Murris, 1980). These source facies are interpreted to have deposited in a restricted, partly anoxic intrashelf basin separated by carbonate grainstone and dolomitized facies from the open-marine environment of the Neo-Tethys Sea to the east (Ayres et al., 1982). According to Ayres (1982), these source rocks have a distinct wireline log character due to the high organic content (high resistively and low sonic velocity) with low porosity (2-6% porosity). The high organic productivity may be attributed to climatic and oceanographic conditions. There was oceanic upwelling at the margin of the Neo-Tethys with its prevailing southeasterly trade winds (Stoneley, 1990). The Upper Jurassic reservoirs consist mainly of limestone. Most of the reservoirs are formed of carbonates with keep-up sheet-like geometry deposited during a steady rise in sea level of the transgressive systems tract in the early Upper Jurassic. These reservoirs became increasingly regressive and contain shallower facies toward the top of the Jurassic and were culminated by the deposition of the regional Hith evaporite seal. Following is a brief description of the reservoir units starting with the Tuwaiq Mountain and ending with the Hith Formation. This formation consists mainly of aphanitic limestone and dolomites deposited in a shallow-marine shelf setting. It includes the Upper Fadhli reservoir and the Hadriya reservoir (Powers et al., 1966). The Hanifa Formation consists mainly of shales in the lower organic-rich, laminated lime mudstone and low-porosity skeletal wackestone, which constitutes the main Upper Jurassic source rocks, and a grain-rich carbonates that include skeletal packstone, grainstone and coral/stromatoporoid boundstone in the upper part and northern region, which represents the Hanifa Reservoir (Ayres et al., 1982 and Alsharhan & Nairn, 1997). The southern region of the Hanifa Formation represents a deeper depositional setting and consists mostly of lime mudstone with very low porosity (almost 0%) and low permeability (<10 md) (refer to Hanifa sequence stratigraphy for more detailed discussion of the Hanifa Formation). The northern part of the formation formed in a shallower depositional setting and consists mostly of the shallow shelf skeletal grainstone and stromatoporoid boundstone complexes. This region of the formation represents the Hanifa Reservoir in Berri Field. 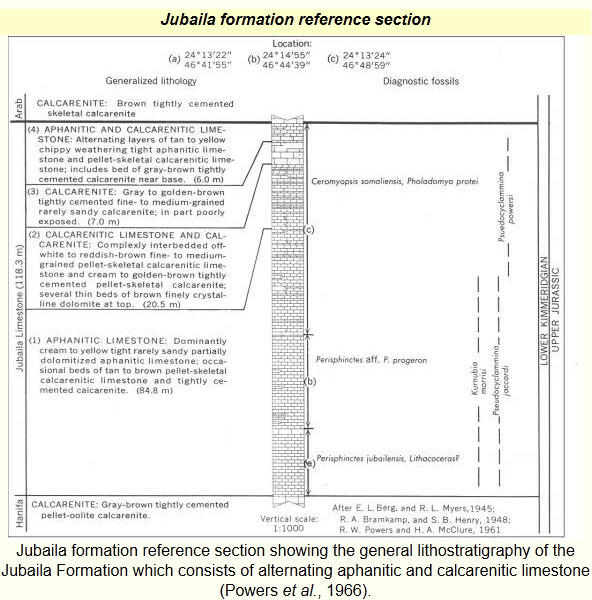 The Jubailah limestone consists of partially dolomitized aphanitic limestones in the lower two-thirds of the formation and calcarenitic limestones in the upper part of the formation (Powers et al., 1966). These limestones were deposited in a shallow-marine shelf setting. Most of the production of this formation occurs in the Ghawar, Abqaiq, and Khurais fields (Alsharhan and Nairn, 1997). The Arab Formation limestone and anhydrite deposition follows the nearly pure limestone of the underlying Tuwaiq Mountain limestones, Hanifa, and Jubaila. The Arab formation is represented by four shoaling-upward cycles (from bottom to top: D, C, B, A) consisting of a lower unit of bioclastic lime mudstone or wackestone with normal marine fossils, a middle grainstone unit of clean washed calcarenite composed off rounded skeletal particles, and an upper thin tidal-flat dolomite mudstone that grades within a few feet to thick nearly pure supratidal anhydrite (Alsharhan and Kendall, 1986). The facies of the Arab members were deposited in high-energy depositional environment during a sea-level highstand in an arid climate. These represent keep-up sequences that were initiated with transgressions and ended with highstand grain carbonates and sabkha evaporites (Wilson, 1985 and Kendall et al., 1991). 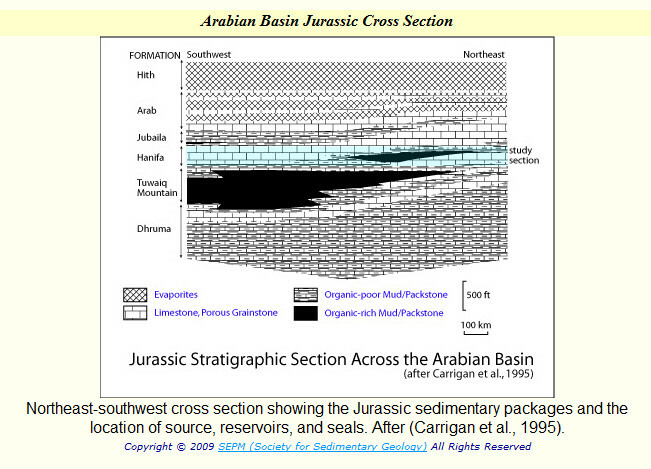 The Arab-D reservoir accounts for most of the Jurassic oil in the Arabian Gulf. It occurs stratigraphically above the Hanifa source rock (separated by the Jubaila) and is regionally sealed by the Arab-D anhydrite. The percentage of calcarenite in the Arab-D is greater than 25% with maximum effective porosity from 11% to 17% and average permeability at about 100 md (Edgell, 1987). The upper part of the Hith Formation consists of interbedded dolomite and limestones deposited in a shallow-marine shelf and supratidal settings. 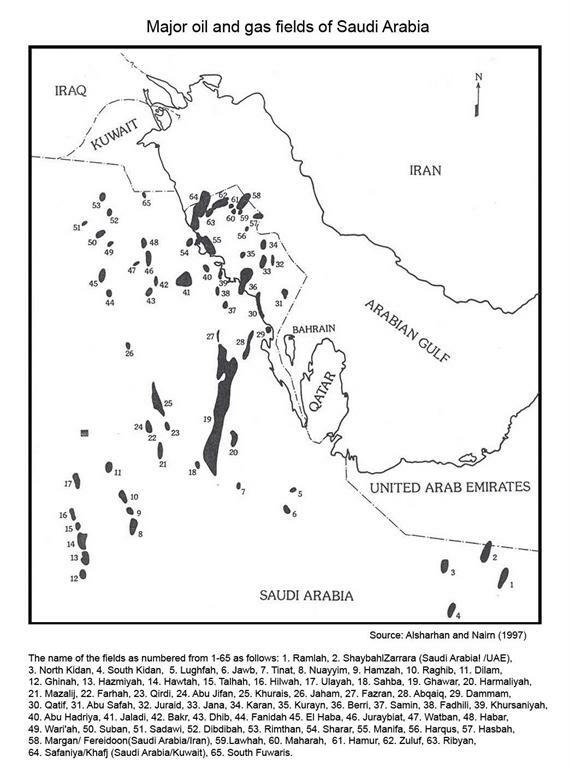 The porous calcarenite facies contain major oil reserves in the offshore Manifa reservoir and Abu Hadriya (Powers et al., 1966). The Hith Formation reservoir is also produced from a limestone in the lower Rimthan Field (Alsharhan and Nairn, 1997). For every formation in the Upper Jurassic section, there exists a corresponding overlying seal deposited during the late high stand or early low stand of each sequence. These form a cap for the reservoir rocks beneath. The Anhydrite beds of the Hith Formation overly the Arab formation of the Upper Jurassic and form a regional cap rock for the oil and gas accumulations. The euxinic dense lime mudstones of the lower Hanifa act as a seal for the underlying Dhruma reservoir. The shales interbedded in a carbonate reservoir act as seals for the underlying reservoirs. 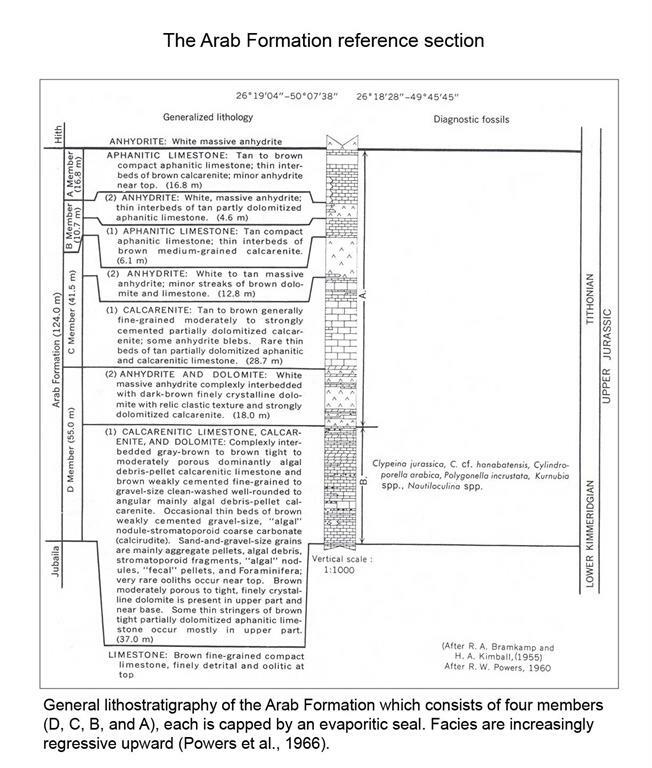 Each member of the Arab Formation (Arab-D through Arab-B) is capped by an evaporite seal. Hith anhydrite at top of the Upper Jurassic serves as a regional seal to the underlying prolific Arab Formation carbonates. In Tithonian time, the climate became arid, so that extensive evaporites were accumulated on the very shallow southern platform in a sabkha and playa setting. This represents the final regressive supratidal phase of the Late Jurassic (Murris, 1980). Most of the Jurassic and Cretaceous oils are believed to be the result of hydrocarbon vertical movements from the underlying Tuwaiq Mountain and Hanifa source rocks. The regional Hith Anhydrite seals off the Jurassic Arab reservoirs. Carrigan et al. 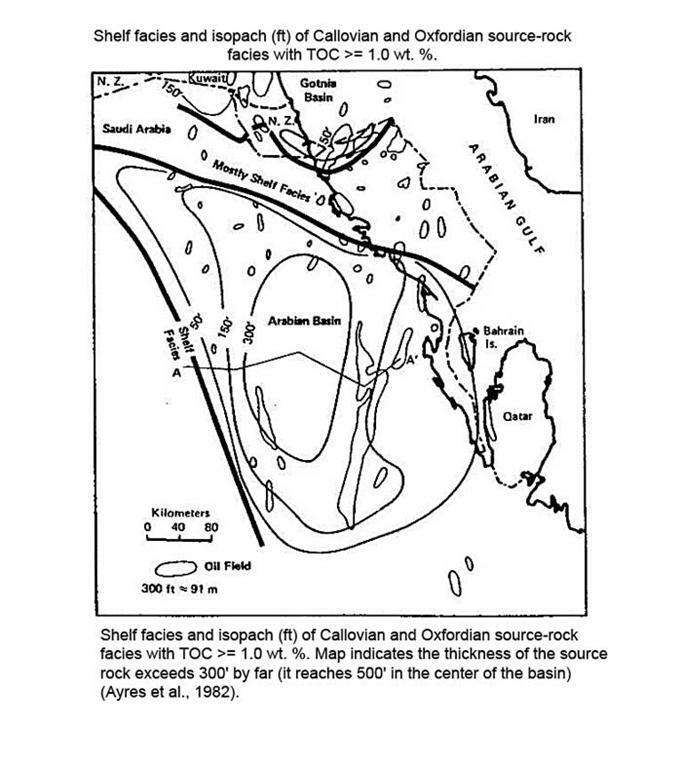 (1995) indicated the timing of oil generation and expulsion from the source rocks coincided with the development of the large structures that formed the reservoirs and include the giant Ghawar anticline. This essentially meant that the necessary parameters for preserving the generated hydrocarbons were present in the right place at the right time and the prolific reservoirs of eastern Arabia were developed.